This specification defines a set of DOM 3 Events [ DOM3EV ] compatible events and DOM APIs related to media access. The defined events and APIs enables detailed monitoring of media stream buffering and initialization. They are designed to be easily combined with the SVG Tiny 1.2 [ SVGT12 ] uDOM but can equally well be combined with other, larger DOM APIs. This is a W3C Last Call Working Draft. If the feedback is positive, the SVG Working Group plans to submit this specification for consideration as a W3C Candidate Recommendation. Comments for this specification should have a subject starting with the prefix 'MAE: '. Please send them to www-svg@w3.org, the public email list for issues related to SVG. This list is archived and acceptance of this archiving policy is requested automatically upon first post. To subscribe to this list send an email to www-svg-request@w3.org with the word subscribe in the subject line. Comments are accepted until 1 March 2008. This document was developed by the SVG WG as part of the W3C Graphics Activity. The Working Group expects to advance this Working Draft to Recommendation Status. Web content and browser developers are encouraged to review this draft. Please send comments to www-svg@w3.org, the public email list for issues related to SVG. Archives of the list are available. Streamable media, such as audio and video, is streamed over the network and is processed on the client as it arrives. This leads to different behaviour compared to downloaded media. The client normally holds a buffer where it stores part of the media prior to processing it. The state of this buffer affects the client. For example, if the buffer fills too slowly in relation to client processing the client will have to stall processing while it waits for the buffer to fill. It is often of interest to monitor the state of the buffer and client, and the purpose of correlating media access events introduced in this specification is to facilitate such monitoring. Initialising a session containing one or several media streams often takes a considerable amount of time. The author may wish to give the user some feedback that this setup is in progress and, when setup is done, present information of the available media streams. The Media Access Events namespace is http://www.w3.org/ns/media-access-events# . The examples in this specification use a namespace prefix of me to denote the Media Access Events namespace . A session is a set of synchronized streams rendered by a single media element. The following state chart illustrates the flow of events generated when streaming a media resource. Even if multiple streams are rendered by a single media element within one session , only one event is fired at each stage. The UA goes into the Setting Session state, firing a 'BeginSessionSetup' event. If a connection request needs to be sent to the server, it is sent during this phase. The UA goes into the Session Setup state, firing a 'EndSessionSetup' event, upon completion of the session set up on the terminal. If the session setup cannot be completed, the UA goes into the Stopped state and fires a 'Error' event. If a connection to a server was attempted, it was successful. The UA goes into the Reception state, firing a 'DataRequest' event, while sending a request for data to the server. If the data request cannot be sent, the UA goes into the Stopped state and fires a 'Error' event. While in this state, the UA may fire 'DataReceptionProgress' events. The UA goes into the Reception and Playing state, firing a 'Playable' event, when enough data has been received to start playing. If the operation is unsuccessful, the UA goes into the Stopped state and fires a 'Error' event. While in this state, the UA may fire 'DataReceptionProgress' events. From the Reception and Playing state, the UA may either go into the Playing state, firing a 'EndOfDataReception' event, when the end of the data has arrived, or back into the Reception state, firing a 'NotPlayable' event if there is not enough data available to continue playing. If the operation is unsuccessful, the UA goes into the Stopped state and fires a 'Error' event. 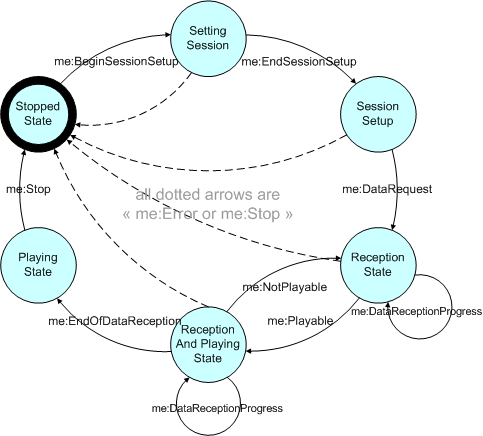 From the Playing state, the UA goes into the Stopped state, firing a 'Stop' event, at the end of the playing of available data. If the operation is unsuccessful, the UA goes into the Stopped state and fires a 'Error' event. The Media Access Event module contains basic event types associated with media access. This interface inherits from the Event interface in the SVG uDOM [ SVGT12 ]. Initialization of a session failed. One of more of the streams within this session contains media not supported by the User Agent. One of more of the streams within this session is corrupt and playback is stopped. Specifies a percentage value of the current buffer level. This value is only of relevance for 'DataReceptionProgress' events. If the session contains multiple streams, then the reported value is the minimum buffer level over all the streams of the session . If false the buffer level is unknown and the value of bufferLevel SHOULD be ignored. Specifies the playing time (in seconds) of the current content of buffer. This value is only of relevance for 'DataReceptionProgress' events. If the session contains multiple streams, then the reported value is the minimum remaining time over all the streams of the session . Specifies the error that has occured. One of STATUS_OK , STATUS_ERROR_ON_SETUP , STATUS_ERROR_UNSUPPORTED_MEDIA or STATUS_ERROR_CORRUPT_STREAM MUST be STATUS_OK for every event type except 'Error' . Returns information about the different media streams in this session . The list of streams in this session . Returns the name of the media access session . The media access session name. The Media Access event types are listed below. Even if a state is not relevant to a particular delivery protocol or implementation, the corresponding events MUST be fired. For example, if there is no session setup phase, then events 'BeginSessionSetup' , 'EndSessionSetup' and 'DataRequest' MUST be fired together in that order. A 'BeginSessionSetup' event MUST be fired at the beginning of a streaming session . An 'EndSessionSetup' event MUST be fired after a 'BeginSessionSetup' event when the initialisation of a streaming session has been completed. A 'DataRequest' event MUST be fired when the UA sends the request for data to the server. An 'Playable' event MUST be fired after a 'DataRequest' event when enough data is available to start or resume playing. The User Agent MAY dispatch 'DataReceptionProgress' when data is being received. Information on the current buffer level SHOULD be available. An 'NotPlayable' event MUST be fired when not enough data is available to continue playing. An 'EndOfDataReception' event MUST be fired when the data reception has finished. A 'Stop' event MUST be fired when the data reception has finished and all received data has been presented. An 'Stop' event MUST be fired when an end condition has been met within the media element, e.g. one expression in the end attribute has become true or endElement() has been called on the media element. In that case, the 'Stop' event MUST be sent before the endEvent to be dispatched from the media element. An 'Error' event MUST be fired when an error occurs. The error code provides information about which kind of error has occured. The MediaStreamInfo interface stores information about a media stream. The format of the media in this stream. E.g. "H264". This attribute MUST match the format as specified by IANA , see listing [ MIME-Media-Types ]. Returns the index th item in the collection. If index is greater than or equal to the number of MediaStreamInfo s in the list, this returns null . The MediaStreamInfo at the index th position in the MediaStreamInfoList , or null if that is not a valid index . Unless otherwise specified immediately following the header, all sections in this document - to the exclusion of examples which are all informative - are normative. Three examples to illustrate the usage of streaming events. 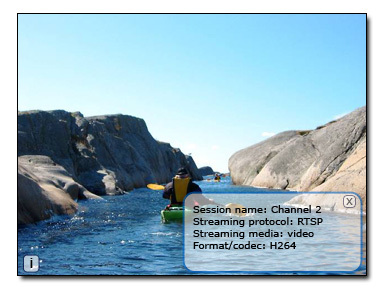 The following example shows the streaming of video. When the playback of the video is stalled due to network congestion, a simple text is displayed. When the playback resumes, the text is removed. The following example shows streaming of video within svg. When playback of the video is stalled due to a lack of video data a progress bar is displayed. The progress bar indicates how much buffering that is needed before playback can be resumed. The example is not runnable as is since the intention is to show an example of using streaming events, not to give a complete svg example. This example shows streaming of video within svg. An svg-button is available and when clicked it displays a box with information about the video stream. As with the example above this one isn't runnable as is since the svg markup isn't complete. The image to the right shows a possible rendering of the info box in this example. The authors would like to thank Cyril Concolato for his thorough review and excellent contribution. We would also like to thank Robin Berjon for ReSpec, the editorial framework upon which this specification is written. Scalable Vector Graphics (SVG) Tiny 1.2 Specification , Ola Andersson <ola.andersson@ikivo.com>, Robin Berjon <robin.berjon@expway.fr>, Jon Ferraiolo <jon.ferraiolo@adobe.com>, Vincent Hardy <vincent.hardy@sun.com>, Scott Hayman, Dean Jackson <dean@w3.org>, Craig Northway <craign@cisra.canon.com.au>, and Antoine Quint <aq@fuchsia-design.com>.